This article is taken from the Battle of the 10s issue of These Football Times Magazine, which you can order today. “Who’s that black guy that scored three goals in 20 minutes? He’ll be some player.” Pelé was dumbstruck. His two goals had helped Santos secure a 6-3 win over Benfica in the Tournoi de Paris, but everybody was looking at the second half substitute, whose savage pace and brutal shot had seen him pillage a 17 minute hat-trick. L’Équipe’s headline the next day said it all: ‘Eusébio 3, Pele 2’. 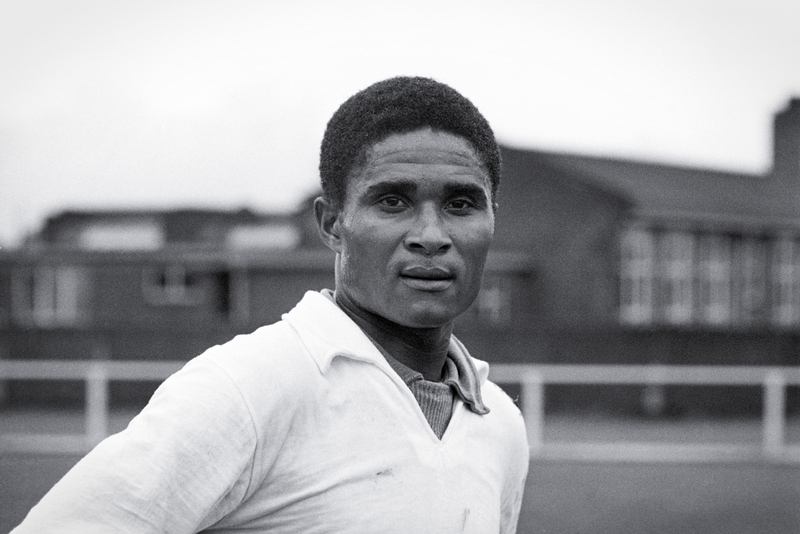 Eusébio da Silva Ferreira, Africa’s original footballing superstar, had arrived. Life in Mozambique should have been difficult. Portugal was a crude overseer of a colony that was blessed with cotton and sugar, and the indigenous population was brutally oppressed. Human rights were an afterthought, with protests quelled with gunfire and murder. In Eusébio’s hometown of Lourenço Marques, locals were forcibly evicted from the town centre, struggling to survive in shanty towns far from the ‘Concrete City’ of apartments and boulevards built for their imperialist masters. None of this mattered to Eusébio, though, whose interests became obvious at an early age. As a child he would often skip school just to play football with his friends, with a ball improvised from rolled up newspapers and socks. Football boots didn’t exist on the gravel pitches of the Mafalala neighbourhood, but the talents of this barefoot teen soon made themselves known. He joined Sporting CP’s feeder club Sporting Clube Lourenço Marques when he was 15, seven years after his father tragically died from tetanus. By the time the Brazilian José Carlos Bauer brought his Ferroviária side on a tour of Mozambique in 1960, Eusébio had already led his side to the championship, but his first real step towards greatness occurred that afternoon against the team from São Paulo. Bauer could only watch as a powerful, quick teenager walloped two goals against his bewildered defence. He knew immediately that he’d witnessed something special. “What’s up? Have you found anything for me?” Béla Guttmann asked half-jokingly on Bauer’s return from Africa. The Brazilian had played for the Benfica manager at São Paulo, and had bumped into him a few months before at a barbers in Lisbon. Mentioning the upcoming tour, Bauer had promised to tell him if he came across any promising young talents. “I saw a black lad in Mozambique,” Bauer said. It was all that Guttmann needed to pounce, sealing a deal for 400,000 escudos. Before signing for Lourenço Marques, Eusébio had been recommended by defender Hilário to Benfica’s Mozambican feeder club. The coaches at O Desportivo had rejected his ability out of hand, however, refusing to even grant him a trial. Understandably, then, the Sporting hierarchy were incandescent that their rivals had poached a talent from under their noses, particularly one that played for their own club. They offered Eusébio a trial, but he refused. The boyhood Benfica fan had made up his mind. On his arrival in Portugal, Guttmann took every precaution against Sporting’s scouts making contact with his 18-year-old prodigy. Eusébio was given three bodyguards and sequestered to a house in the Algarve until the particulars could be agreed. Benfica’s new forward hadn’t even seen a proper pitch before making the move to Portugal, but it took minutes for Guttman to realise the masterstroke he’d pulled. “This boy is gold,” he purred to his assistant Fernando Caiado, as Eusébio streaked past his slack-jawed teammates in training. Initially they were wary. A talent like that meant that somebody had to give way, and Eusébio’s self-belief jarred in a team that had only recently been crowned European champions. After scoring another hat-trick on his league debut against Atlético Clube, however, the doubters were silenced. Eusébio slotted in seamlessly alongside José Augusto and Antonio Simões, scoring 27 goals in 30 games whilst his compatriot Mário Coluna pulled the strings from deep. Austria Vienna, Nürnberg and Tottenham were all dispatched on the way to a second successive European Cup final. Real Madrid were the only obstacle between the Portuguese and another glorious triumph, but while the Spaniards were coming to the end of a cycle, they still boasted two scions of world football in attack. Even at 35 and 33, Alfrédo Di Stefano and Ferenc Puskás were lethal. The former had been Eusébio’s hero growing up, but if he was starstruck he didn’t show it. With the scores level at 3-3, he received the ball on the halfway line before powering past the tired challenge of his waning idol. As he bore down on the box, Pachín crudely blundered into him. José Araquistaín had no chance from the resulting penalty. Five minutes later, Eusébio scored the goal that would secure his place in history. After a Benfica player was brought down for a free-kick outside the box, Coluna pushed the ball into the path on the onrushing number eight. Even from 30 yards, the shot was unstoppable, exploding into the bottom corner. Real had been beaten. 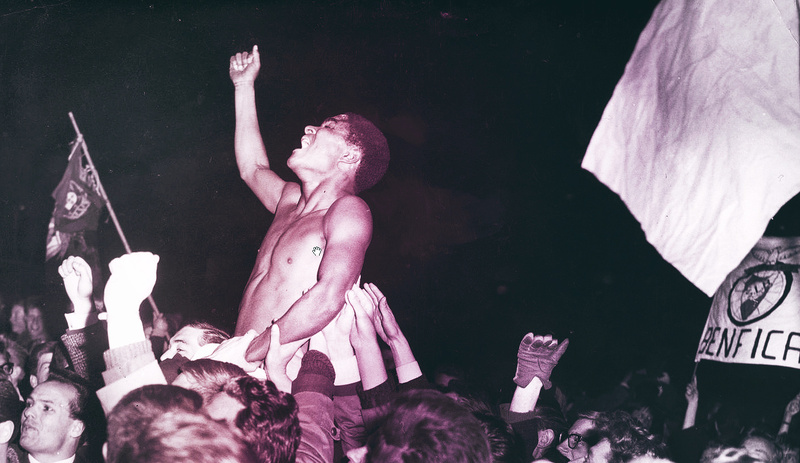 At the final whistle, the crowd invaded the pitch, with a tearful Eusébio lifted on to the shoulders of his adoring fans. The images of him, shirtless and pumping the air with joy, linger in the psyche of Benfiquistas everywhere. After the match, he was approached by the man he’d idealised throughout his young career. Di Stéfano, the greatest player of the greatest team in a generation, wanted to swap shirts. 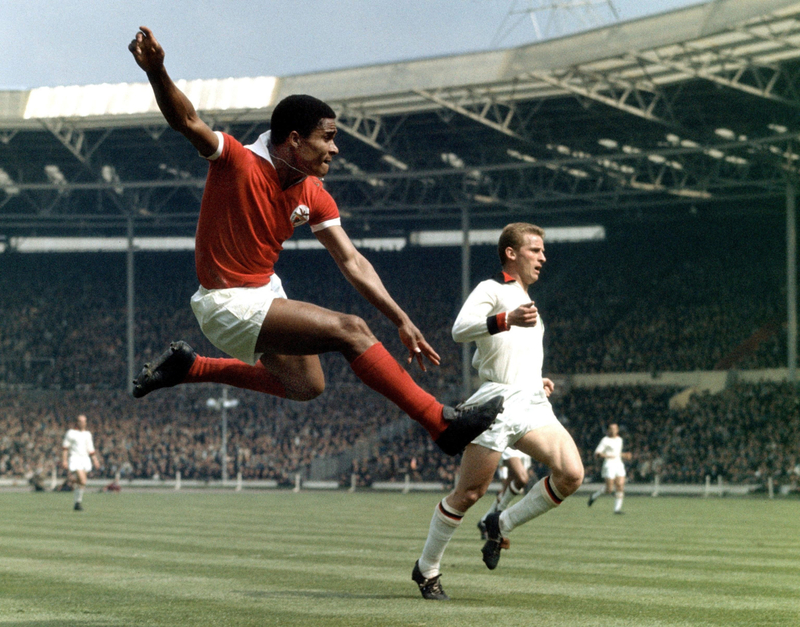 A “flabbergasted” Eusébio had reached the absolute pinnacle. With two European Cup wins in a row, it seemed that a new dynasty was forming in Lisbon. Led by their ‘Black Panther’, Benfica stormed to another two European finals in quick succession, but they were pipped by Milan and Inter respectively. No matter, though, as Eusébio spearheaded his teammates to successive Portuguese championships between 1963 and 1965. Heading to the 1966 World Cup, he was officially the best player in the world, having just won the Ballon d’Or. Portugal were amongst the favourites to lift the trophy at Wembley on 30 July. The guts of Benfica’s all-conquering side travelled to Liverpool, where the Portugal camp was based, and their fluency was obvious after consecutive victories over Hungary and Bulgaria in the group stage. In the final game against Brazil, Eusébio scored two to inspire a famous victory over Pelé and Garrincha’s world champions. At the tournament, the humility that Eusébio would eventually become renowned for manifested for the world to see. After he had been given the number 13 shirt for the tournament, Antonio Simões was distraught. It was his number, the one he had worn religiously throughout his career. In those days the numbers were allocated at random, and Simões had been adorned with the unfancied number 13. No matter – Eusébio switched instantly. The same generosity would make itself evident in the 1968 European Cup final. Through on goal against Manchester United goalkeeper Alex Stepney, Eusébio resolved to blast the ball into the net with his left foot. Stepney saved marvellously, and as the crowd applauded Eusébio joined in too, patting appreciatively on the goalkeeper’s cheek. Back in 1966, however, Portugal found themselves in trouble. North Korea had already conquered Italy by the time they lined-up against the Iberians at Goodison Park, and had stunned them by racing into a 3-0 lead. What followed was perhaps the greatest moment of Eusébio’s career. Prodding in just two minutes after Yang Sung-Kook’s goal, Eusébio took the game to the Koreans, converting a penalty to bring the scores to 3-2. His hat-trick was completed on 54 minutes, latching onto a through ball to blast into the top corner from the far edge of the box. 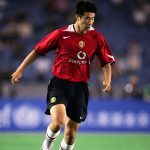 His fourth, a penalty after being brought down at full-speed by a tired Korean defender, confirmed one of the game’s most memorable comebacks. Portugal were through to the semis against England. Days before the game, the English FA announced that the fixture was being moved to Wembley. The news was met angrily by the Portuguese, who accused their opponents of foul play, but Eusébio didn’t buy into the theories. He remained quietly confident, strutting out in front of the 90,000 crowd with the World Cup within his grasp. Nobby Stiles had other ideas. He stuck to Eusébio like glue, and for all of Portugal’s possession, it was England who took the lead, Bobby Charlton sliding into an empty net from 18 yards after Pereira had saved from Roger Hunt. Ten minutes before the end, Charlton scored again to break Selecção hearts. Eusébio’s consolation from the penalty spot was immaterial, but while his country crashed out, he left the tournament as top scorer. Another record had been smashed, but as he burst into tears in front of his teammates on the pitch, those nine goals seemed to matter little. Later that Summer, Internazionale made their interest in Eusébio known. A £3m contract was agreed, but Portuguese dictator António Salazar intervened to block the transfer. He ignored Eusébio’s pleas to be released, issuing a decree that said he “was an asset to the State”. Benfica were a propaganda tool of great importance, and their star simply would not – could not – be allowed to leave. “With Eusébio in the side, we could win the European Cup,” admitted his friend and teammate Simões. “Without him, we couldn’t win the Portuguese league.” Just as well, then, that Eusébio won the Golden Boot and brought his side to the European Cup final against Manchester United in 1968. Just as he had two years earlier, Eusébio found himself suffocated by the unrelenting attention of a certain Nobby Stiles. It was anti-fútbol but it worked, with United romping home 4-1 in extra time after Eusébio’s miss in the dying moments. Another Golden Boot followed in 1973, but when the Carnation Revolution deposed Salazar’s Estado Novo regime in 1974, Eusébio was finally allowed to leave. He departed for the comfort and dollars of America, joining the Boston Minutemen before helping the Toronto Metros win the North American Soccer League. With his knees giving out, he retired from the game altogether in 1979. “I think he is immortal,” said José Mourinho, whose father Félix had saved Eusébio’s penalty on his Benfica debut. “We all know what he meant for football, and especially for Portuguese football.” As the Black Panther was laid to rest in Lumiar cemetery, the millions who mourned his loss were all the legacy he needed. In Lisbon and Maputo, the Black Panther will always be righteous. If you enjoyed this article, consider supporting our independent journalism and purchase a copy of These Football Times magazine.